We’ve seen phones made out of anything, but still I’m puzzled by this Soft Phone concept, made from cotton. It’s been designed by Qian Jiang and it uses electronic cellulose structures to create an unique, soft and flexible handset. 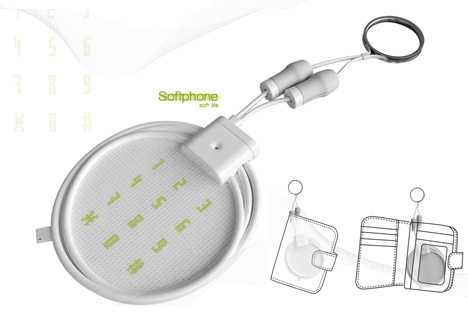 The Soft Phone is basically made out of a series of discs plus electronic fabric, while its interface is gesture-based. Well, you won’t use normal gestures, like flicking the phone or gently moving it, but you’ll squeeze this cotton wonder, instead, in order to hang-up for example. Deform the touchable surface and the phone feels the input. How cool is that? You can turn the device’s keypad into a real QWERTY keyboard by using the phone’s collapsible structure, while the phone’s “guts” are held inside a tiny clip made out of resistant silica. What next? A chewing gum phone?